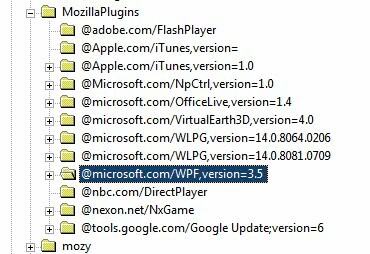 Firefox users who run Windows with the latest Microsoft .net Framework 3.5 SP1 installed may have noticed a message yesterday on browser startup that was informing them about the Windows Presentation Foundation plugin and the Microsoft .net Framework Assistant add-on. Quite a few things puzzled many users about this: most were pretty sure that they did not install the add-on or plugin in first place which made it even more mysterious to them as it meant that some other program or someone else must have. 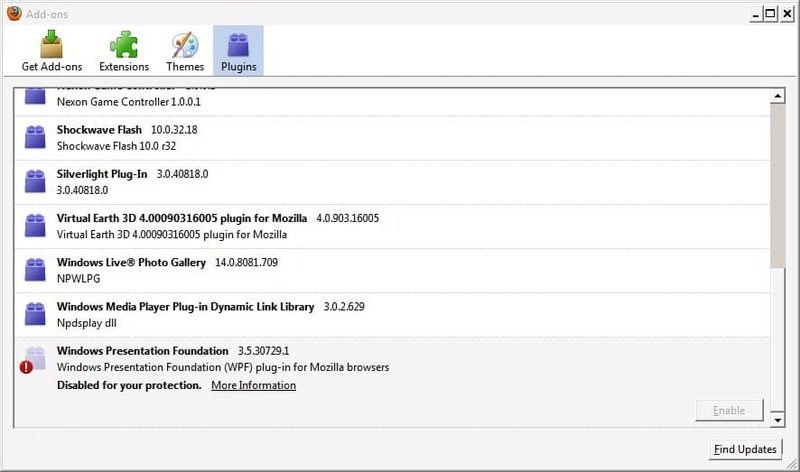 When they checked the plugins section in Firefox add-ons they also noticed that they could not uninstall the Windows Presentation Foundation plugin in Firefox. Only the option to disable it was provided but that is obviously not the same as removing it from the web browser. Mozilla in the meantime has disabled the add-on using a global hotlist. The following is a guide on how to remove the Windows Presentation Foundation plugin in the Firefox web browser for good. If the plugin would not be blacklisted it would be possible to find out about its dll files by typing in about:plugins in the web browser address bar. Close the Firefox web browser and every other Mozilla software that is running. Go to x:\WINDOWS\Microsoft.NET\Framework\v3.5\Windows Presentation Foundation\ in windows Explorer where x is the drive letter where Windows is installed on the computer system. Right-click the sub-key and select Export to backup the key before deleting it. Restart the computer system or kill and reload explorer.exe in Windows to load the Registry without the key. This should get rid of the Windows Presentation Foundation plugin in Firefox for now. But what exactly do these Microsoft add-on’s actually DO? What benefit do they offer the user? JoJo I remember that the Framework Assistant plugin enabled one click installations, whatever that means. It is probably something that less than 1% of all Firefox users need. The WPF seems to be for rendering which suggests that it will only work on websites that make use of that technology. Again probably something that no user will ever come in contact with. To answer Jojo’s question: Microsoft offers you the “genuine advantage” of being as wide open to hacks as Internet Explorer. Now all your third party programs can be just as genuinely advantaged as Microsoft’s. I did a much easier solution: I just removed .Net totally from my PC’s. There’s absolutely no need for .Net except for some hack programs that requires it to run the keygen. For that, I have the .Net in a sandbox. Have many people remove the .Net and Microsoft loses money on their .Net marketplace. Microsoft will than have to rethink their high handed fascist ways. Errrr, doesn’t VLC require .net to install? Comodo? It’s Sunday a.m. and I’m still foggy, but there are a few quality(not MS) programs that have prompted me to install .net framework before continuing. Seems hasty to remove completely. Well that may work for you, but for me, and thousands of others, that is not an option. For one I run WindowBlinds, and that needs the Net framework. I know there are others that feel like we should just have the choice to install what we want. Nice try though. A senior editor should know the difference between “its” and “it’s”. No-one on the planet is typo free. We all make mistakes. I have now 80 days without a restart of my computer… so cannot spoil my record now but will do when XP crashes next time or I move and need to unplug the machine. What is this? I thought that Window’s selling point is that it is easy to use. This is easy? I’ve coded a batch file to remove the plugin, plus the accompanying Firefox .NET extension. This can then be easily added to a login script or such so you can remove it from multiple systems. The only people who use some of those types of plugin are long term government analytics and that being said will not even be read in ten to twenty years based on your level of integrity risk affluency.